"We think Repeat Signage is marvellous. We've been delighted with the support offered, the team have bent over backwards to help". Excellent is the only word that should be used to describe the software, customer service, support and attention to detail that Repeat Software provide. This image is a sample presentation, easily created with Repeat Signage Standalone edition, displaying a playlist of images and newsfeed messages. Sample presentations. Digital signage software doesn't need to be complicated nor expensive, to get your message across to your customers on your display screen. 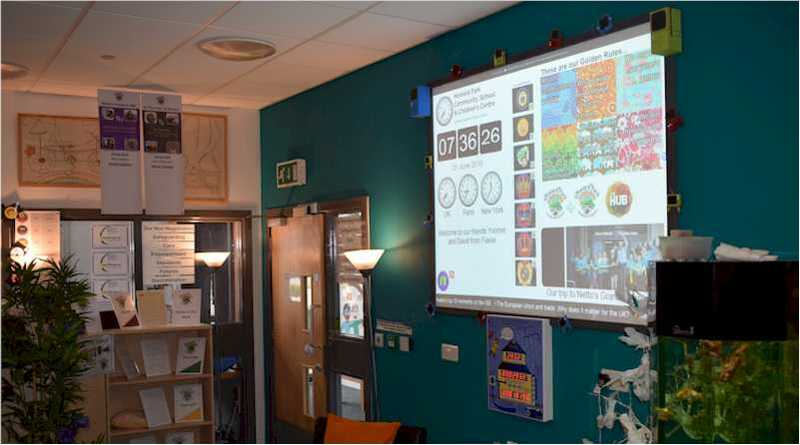 Easy-to-use, after downloading Repeat Signage digital signage software onto your Windows computer, you can create a presentation in minutes. You can insert your logo, pictures, text and newsfeed messages, real-time and date, audio and other media. Drag and drop to create your presentations. 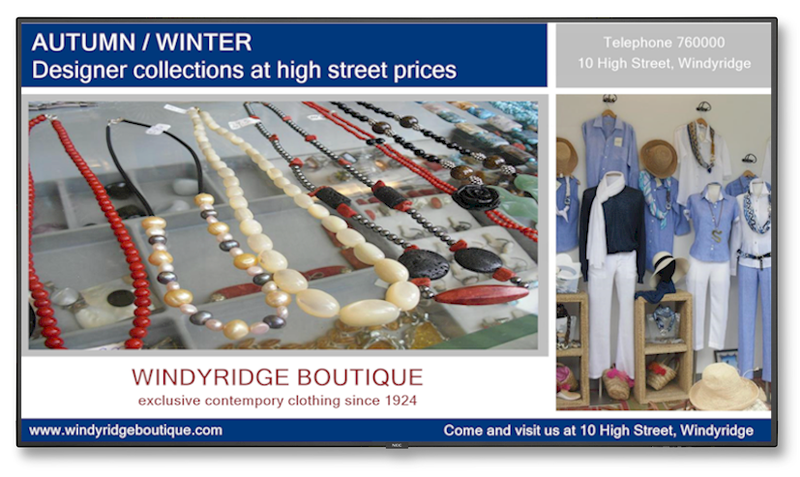 Connect to any display screen, small or large, landscape or portrait, to advertise your services, news and events. Supports touch screens. With Repeat Signage Standalone, you can design a presentation and just play it on screen, or when Windows starts. You change your presentation content manually, the only control that allows remote updating is the Flash RSS feed control. Where digital signage computers aren't allowed to be networked, this edition is ideal for a quickly updatable standalone system, with minimal training. The Standalone edition is ideal on small exhibition stands and small shops, with the benefit of being able to promote your products on screen, especially useful when staff are attending to customers. We give you excellent support. The Repeat Software team will give you an outstanding level of support with free online training videos, sample presentations, 1,700+ icons to enhance your presentations and email technical support. We have satisfied customers in 31 countries. 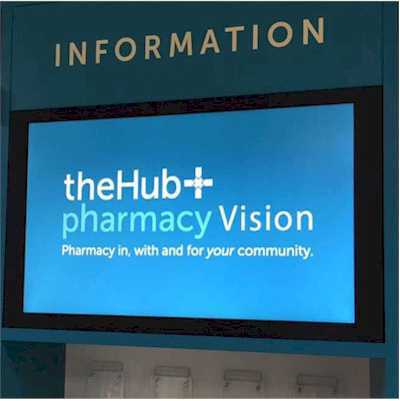 The Standalone edition has a few less features than the other Repeat Signage editions, however, is ideal as entry-level digital signage software with an option to upgrade to a networkable version at a later date if needed. See the comparison list for what features are included. Repeat Signage Standalone licence fee is a one-off payment per PC playing presentations onto one display screen. Manual updating of content. Option to upgrade to networked and Internet based edition. No on-going costs. Repeat Signage Standalone edition is used in primary and independent schools, individual shops, at exhibitions and non-networked military use. We also have this in use on some RAF (UK Royal Air Force) bases in the UK for displaying information. Because of internal security policies, the digital signage computers were not allowed to be networked, so a quickly updatable standalone system, with minimal training, was required. Several of our major competitors are Internet based digital signage systems, so simply cannot be used in this type of situation. Excellent is the only word that should be used to describe the software, customer service, support and attention to detail that Repeat Software provide. It's a pleasure to deal with such professionals. 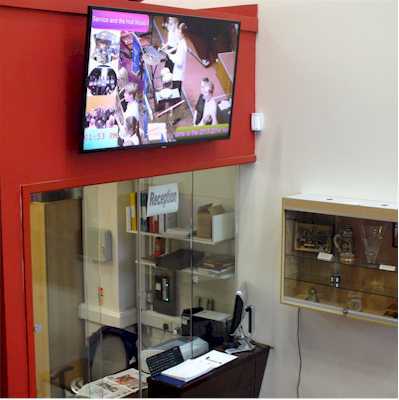 The Repeat Signage digital signage software has provided us with an almost bespoke solution that companies, wanting to charge us thousands, still harass us with." Marcus Newby, Head Teacher, Howard Park School, UK. 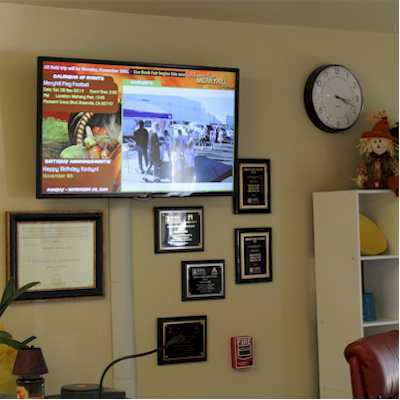 Repeat Signage Standalone digital signage creating a vibrant and welcoming reception area display. "I arrived in 2015 and was eager to relaunch the school with new, fresh branding. This included re-inventing an unloved area into a vibrant and welcoming reception area. Initially, we considered the ubiquitous PowerPoint but soon ran into the tedium of predictable transitions and graphics. By luck, good fortune sent Repeat Signage in my school's direction. Repeat Signage was immediately a joy to use, enabling my staff and me to simply to create stunning 'blue sky thinking' and tech savvy presentations that really do make an impact.